I’m back in media research mode now, and I’m teaching undergraduates about psychosis this week, hence the topic. There are some exceptionally brave people who have posted on YouTube about their experiences of psychosis. I’ve picked some of the most interesting material I could find and have summarised it below. I’ve gone a bit further than normal and added quite a lot of my own reflections on the videos (I hope this is a good thing). The list of videos below is far from exhaustive and as always I welcome any other suggestions and feedback from readers. Schizophrenia: My Story. In this video Maya briefly recounts her experience of developing voices and her diagnosis of schizophrenia at 17. She tells of how her problems started with sexual abuse that began at age 10 and lasted for a decade. In her early teens, she lost interest in the things she used to like (such as sports), and this led to her father taking her to a doctor. Having told the doctor that she was thinking of suicide as he was admitted to hospital, at which point she told the doctors about the voices she was hearing. She says that she now has 7 voices and discusses briefly how the voices evolved over time and how they relate to her experiences of abuse. This story is one I have heard all too many times from clients over the years (and I only began my clinical training in 2009). However, the familiarity of this story may mean that it will be particularly useful for all those who have similar stories. This is just one of quite a few videos by Maya about her experience. I’ve not watched them all, but those that I have all are excellent. They are well paced, concise and compelling, which is not always the case on YouTube. One of the more difficult things about these videos however is that they are done in ‘real-time’. This is a real person, providing regular updates about their progress. Thus, when she tells us that she is coming off medicine without her doctor’s knowledge or help, I cannot help but feel concerned for her. And when we see her a month or so later (just two weeks before this post), struggling more with her voices (but still very coherent), this concern does not abate. It seems that Maya is using YouTube to process her own experiences, and perhaps as a kind of therapy. Beyond this, she is reaching out to her audience to form some social connection, as she notes that she has ‘no friends’ in the physical world. We know that supportive social networks in the physical world are important in staying well, but in the absence of a strong physical network, perhaps online networks can provide some of this support. Finally I notice that Maya has subscribed to rawsammi’s channel, which I covered some time ago in another blog post. Rawsammi is another youtube poster, who talks about her diagnosis of bipolar disorder. There’s definitely a good story to be told about how people are using youtube to connect with and support each other. Autumn is another YouTuber with a diagnosis of schizophrenia. Like Maya above, she has a channel of videos all about her experience of schizophrenia. In the video above, she tries to make sense of what caused her schizophrenia. Her struggle in working this out mirrors the struggle of all clients, psychiatric professionals and researchers. After many decades of research, we know there is no single clear cause of psychosis, but in most cases it is likely that a complex set of genetic and environmental causes are involved. This is not just a case of genes or environment, but gene-environment and environment-environment interactions (which I think I may write about in a future post). Unlike Maya, she describes herself as having a “great childhood”, but that she remembers being paranoid and that she has been told by her parents that she was delusional as a child. From a familial perspective, Autumn talks about how her great-aunt (and other relatives in her maternal line) experienced similar difficulties and thus may have carried genes for psychosis. Interestingly, Autumn talks about how she was a quiet child and suggests that this may have made her symptoms less obvious than they might be in more outgoing people. She says that this meant that her family did not notice anything being seriously wrong until she became very unwell. Like many people I’ve met, stress at school and in her first year of college seems to have exacerbated Autumn’s problems (for many of my clients, the first year of University or exams seem to have been a trigger for manic or psychotic episodes). “I’m not a professional… but I can say I’m a professional on the schizophrenia illness because I’m a schizophrenic*”. It’s a standard trope in psychology to say that while the psychologist is (hopefully) an expert in how the mind works, the person is an expert in themselves. Trope or not, it’s very true, and the person’s own expertise is central to therapy working. Thats also why I’m interested in these videos; it’s my firm opinion that the people who experience these difficulties are the best people to explain the experience, both to other patients and to healthcare professionals. Indeed I first started looking for such videos around 6 years ago in an attempt to open up conversations in group work on the psychiatric ward I was working on (LEO, which at least at the time, was a relatively enlightened and forward thinking place for helping young adults with psychosis). Something else that Autumn mentions is vitamin B12 deficiency as a potential cause of psychosis symptoms, which is not something I’ve come across before. However a (non-comprehensive) literature search, brings up a number of results, including this case study of a 16 year old boy. For me, this is an important reminder to thoroughly check a person’s physical health when they present with psychological difficulties. Finally I thought I’d point you towards Autumn’s art video, which I’ve not watched properly, but which perhaps reflects a common, but not universal, flip side of psychosis, creativity. In this video, IhaveSchizophrenia is currently experiencing auditory and visual hallucinations and he posted it in order to try and show what it’s like to function while having such symptoms. He has a voice that tells him do do things and not to do things (known as a command hallucination), and is seeing animals and letters on the wall. His thoughts are somewhat disorganised and he says he is paranoid – as one might expect when having hallucinations. Like the two vLoggers above, IhaveSchizophrenia, has a variety of different videos about his experiences of schizophrenia – indeed, he’s truly prolific, with dozens of videos. In the video “What Caused My Schizophrenia“, he talks about how his hallucinations started around age 5, and how they were not associated with any stress that he was aware of. However, he then talks about how he was very severely bullied for many years and how the death of his grandfather had a serious impact and how he felt that this ‘pushed me over the edge’. Again, well worth a watch. This is a bit of an odd video. It’s mostly a collection of older videos about people with catatonia. Often these old videos can be rather uncomfortable viewing due to their low production values and questions about consent. Nevertheless, I think the video provides a useful teaching tool on a symptom that is seen much less that it used to be. 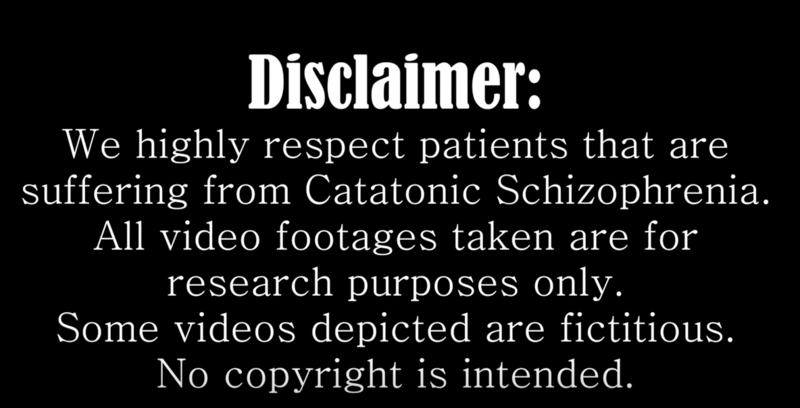 What’s really odd about the video is that it comes with the disclaimer, yet.. the people who made the video chose to add spooky music with rather undermines the idea of respecting the patients. In any case I include it as it could be useful as a teaching aid. These two videos (here and here) attempt to simulate the experience of hearing voices and other auditory hallucinations (they are generally designed to be used with headphones to simulate the stereo nature of some hallucinations). I usually try to check the comments before recommending any video, and in this case both videos were positively recommended by people who hear voices. Again, these videos should be useful as teaching aids. This is more of a classic teaching video. It features four different people with a schizophrenia diagnosis who are all currently experiencing symptoms such as paranoia, delusions, problems with attention and cognitive function. These videos always beg the question of informed consent, however as they are already available on YouTube, I guess we might as well make respectful use of them? The video is actually compiled from the following sources (1,2,4) and one which I can’t find. A short US based documentary on schizophrenia focussing on recovery. This one is a classic educational doc, with various talking heads, a patient advocate, a psychiatrist, a clinical psychologist, and various patients talking about their experiences. It covers a variety of issues including how people can be helped by their family, the different types of symptoms a person might have, the behaviours associated with this, the use of medication. Schizophrenia is a disorder of the brain. Schizophrenia, like pretty much all the other psychiatric disorders might commonly fall under the category of IED. Society often triggers psychosis, and then makes it worse by stigmatising the people it has hurt. The fact that the documentary singularly fails to give real consideration to this is a real shame. Nevertheless, it’s worth a watch, especially as an introduction to the topic. Another first person account of schizophrenia, this time a TED talk by Cecilia McGough, an astronomer diagnosed with schizophrenia. In this talk, she briefly uses one of my favourite ways of demystifying auditory and visual hallucinations: dreams. Dreams (and daydreams) show that we all have an inbuilt capacity to conjure up realistic sounding conversations with other people who are not in the room with us and realistic seeming visions of people and objects that are not in the room with us… and when we are dreaming, we don’t realise that we are dreaming. Subconscious Brain: I notice that there are voices, but as far as I’m aware, I’m not currently generating these voices. Also, I can’t see those people right now. Therefore these voices must be from real entities that I can’t see. That could mean: I’m hearing devils, someone has put speakers in the room, or that thoughts are being inserted into my head. Conscious Owner of Brain: That’s really really scary. A key part of the talk is about coming out as a person with schizophrenia. And interestingly, after McGough came out, she found unbeknown to her, some of her friends also had the same diagnosis. Her mission is to be a patient representative and to confront the stigma associated with the diagnosis. As part of this she has started a non-profit organisation to help students with schizophrenia. Sometimes it snows as late as May, but summer always comes eventually. A tale of resilience, survival, empowerment and recovery. Probably one of the world’s most watched talks on schizophrenia, for good reason. Again the video is from TED, and has 1.4 million views on YouTube alone. As so often, the ‘psychotic break’ happened in the first year of university. In her case Eleanor experienced a voice constantly commenting on her activities in the third person, ‘neither sinister nor disturbing’ that seemed to be trying to communicating something about her inaccessible emotions. In fact the voices only took on a negative connotation once she’d told a friend and observed the negative reaction. Eleanor talks about how once a person has a diagnosis, often normal behaviours are misinterpreted as aspects of schizophrenia, as the are viewed though the aperture of the diagnosis. She very clearly describes many of the negative consequences of receiving the diagnosis, from stupid throwaway comments from psychiatrists to physical and sexual assault. At the same time she pays tribute to those that helped her recover and thrive. Eleanor proposes that mental health professionals stop asking: ‘what’s wrong with you’, and start asking ‘when happened to you’. I could not agree more. She also argues (along with organisations such as inter voice) that voices are a “sane reaction to insane circumstances”, a functional coping mechanism. A tale of mental illness | Elyn Saks. To Work and To Love. My last video for the post (for the moment), and the third TED talk. I’m too tired now to provide a good description, but be sure it’s worth a watch. Elyn Saks has a diagnosis of schizophrenia and is a professor of law, psychology and psychiatry – and author of the book The Centre Cannot Hold, which shamefully I’ve not read. Yet. There are no schizophrenics, there are people with schizophrenia, and these people may be your spouse, they may be your child, they may be your neighbour, they may be your friend, they may be your co-worker. I’ve decided to add new discoveries and suggestions to a separate part 2 post. Click here to see! Hi, interesting collection of videos. You might also find our psychosis film interesting. Made in collaboration with people with lived experience of psychosis. Thanks Rob. Great film, will add it. Previous Previous post: Lithium and A Manic Episode on the Radio.